I’m excited to announce Shevawn as the winner of the Hush Little Dragon giveaway. She’ll be receiving a copy of this lovely book! We all need a little more sun—at any time of the year—but especially right now! So, today, I’m recommending a song for preschoolers to bring the sunshine in. There is no shortage of excellent Beatles covers in the world. 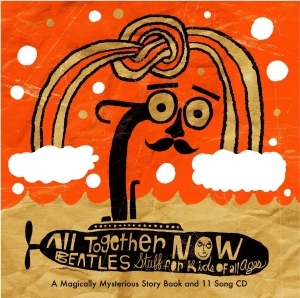 I’m a fan of All Together Now , a compilation of covers “for kids of all ages”. brings a touch of fresh energy to this classic Beatles song. This version is created by The Bangles (though, on the MP3 download, it’s listed under Little Monsters). While I definitely recommend this version, I also understand if you prefer the original. It’s your choice today. But, either way—go turn on these songs and bring a little sun inside! Find this version of Good Day Sunshine on Amazon . Or pick up the Beatles original version on Amazon or itunes. We’re in week 7 of Handpicked: Weekly Song Recommendations for Preschoolers and their Adults. If you’ve missed any previous weeks, catch up now! Don’t miss another week: subscribe now! Do you know other great Beatles covers (or originals!) that kids might enjoy? Share them in the comments below! yes she did! The book is safely in her hands waiting for her grandson’s visit!